JAKARTA, Indonesia — Tottenham forward Son Heung-min is still on target for an Asian Games gold medal that will earn a reprieve from military service. A loss in the next two games will likely mean a serious disruption to his Premier League career in the next few years. 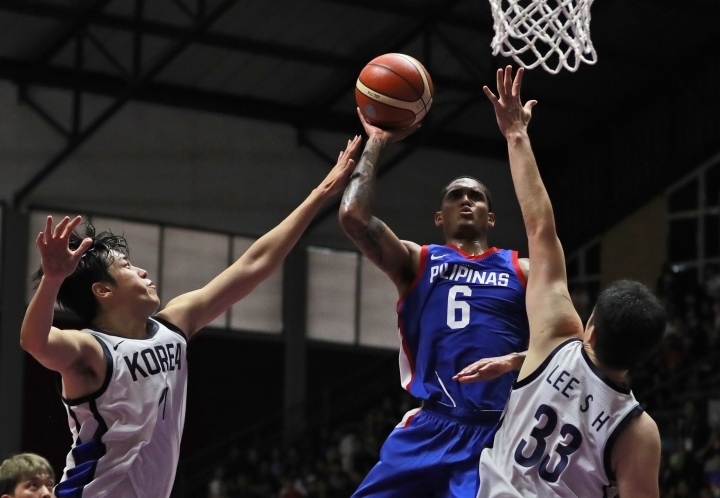 Jordan Clarkson, meanwhile, will have to report back for duty at the Cleveland Cavaliers without a medal after his Philippines lineup lost 91-82 to defending champion South Korea. Clarkson, who got special permission from the NBA to play at the tournament, led the Philippines with 25 points but was closely marked in the quarterfinals. U.S.-born forward Ricardo Ratliffe had 30 points and 14 rebounds for South Korea, which will meet Japan in the semis. Clarkson missed the opening win over Kazakhstan and had a game-high 28 points in the 82-80 group-stage loss to a Chinese team containing NBA players Zhou Qi and Ding Yanyuhang. "Everybody stepped up to guard Jordan Clarkson. I think we defended him really well in the first half," Ratliffe said. Philippines coach Joseller Guiao said his team squandered an eight-point lead, lacked experience and was missing too many regulars. "It was very close until the last five minutes, but again it's just the maturity of this team," he said. "We've been together for less than three weeks." China picked up two badminton titles, with Chen Qingchen and Jia Yifan combining for a 22-20, 22-20 win over Olympic gold medalists Misaki Matsutomo and Ayaka Takahashi of Japan in the women's doubles, and world champions Zheng Siwei and Huang Yaqiong beating Hong Kong pair Tang Chun Man and Tse Ying Suet in the mixed doubles. Chou Tien-chen ended any chance of an all-Indonesian men's singles title showdown after rallying to beat Anthony Sinisuka Ginting 16-21, 23-21, 21-17 in the semis. He next faces local hope Jonatan Christie, who peeled off his shirt to celebrate his semifinal win over Japan's Kenta Nishimoto. 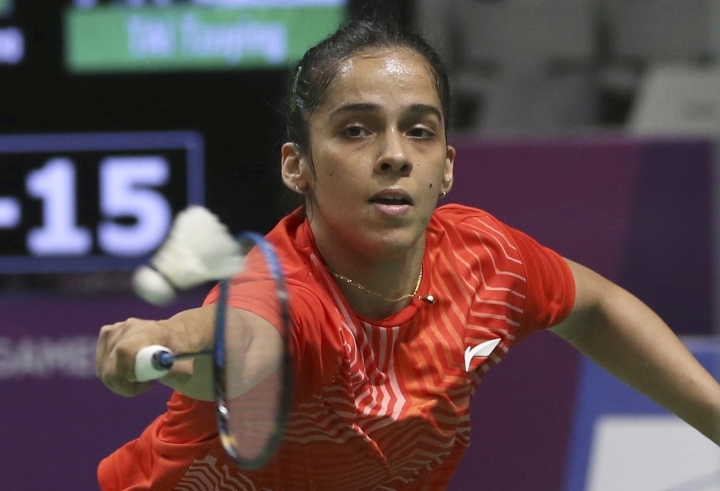 India's Olympic silver medalist Pusarla Venkata Sindhu will play the women's singles final against top-ranked Tai Tzu-ying of Taiwan, who beat India's Saina Nehwal to advance. The soccer quarterfinals kicked off with Japan beating Saudi Arabia 2-1 and South Korea edging Uzbekistan 4-3. Striker Hwang Ui-jo scored three goals for South Korea, including a late equalizer that forced extra time after Ikromjon Alibaev had netted twice in three minutes to give Uzbekistan a 3-2 lead. Alibaev was sent off in extra time and South Korea took advantage. Hwang was dragged down in the 118th minute and substitute Hwang Hee-chan converted the penalty. 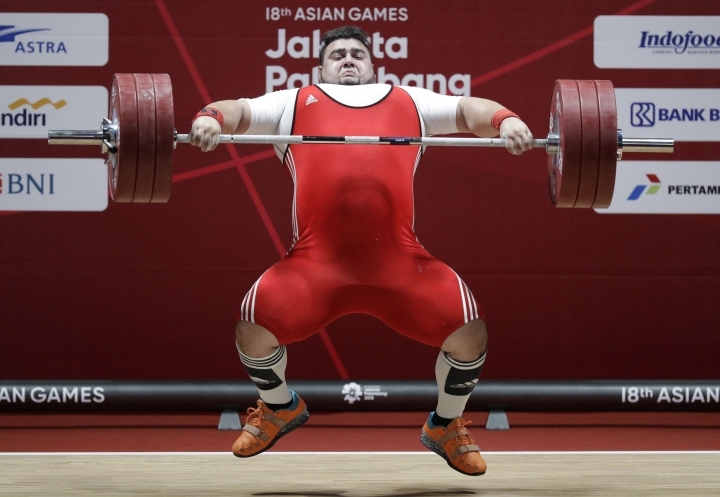 China leads the medal standings with 86 golds and 191 overall, but it trails Bahrain after three days of track and field competition. Oluwakemi Adekoya won the women's 400-meter hurdles in a Games record 54.48 seconds and Winfred Yavi triumphed in the women's 3,000 steeplechase to boost Bahrain's tally to six golds on the track. 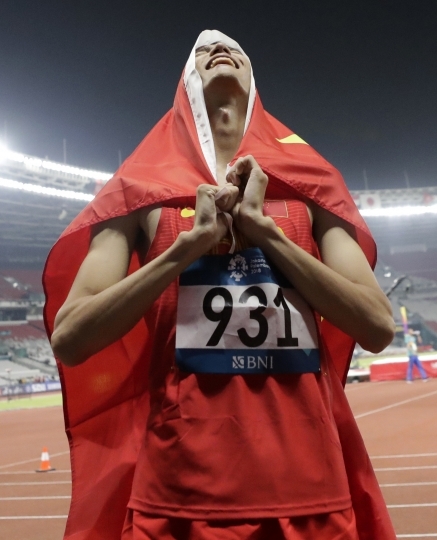 China has five after a high jump victory for Wang Yu. 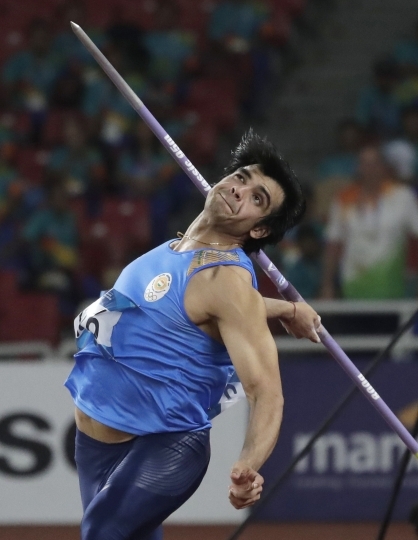 India's Neeraj Chopra won the javelin with a throw of 88.06 meters, while Abderrahman Samba took the 400 hurdles in a Games record 47.66 seconds. 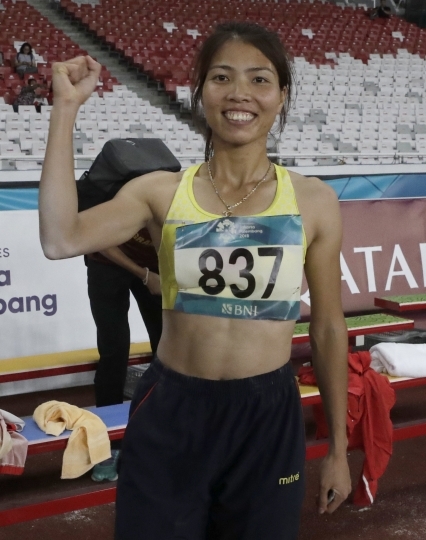 Bui Thi Thu Thao claimed the women's long jump for Vietnam and Iran's Hossein Keyhani won the men's steeplechase in 8:22.79. In the wake of the women's dragon boat crew delivering the first ever gold medal at a major international multi-sports event for a joint Koreas team, paddlers from South Korea and North Korea combined to claim a bronze in the men's 1,000 meters behind Taiwan and Indonesia.